Easter is fast approaching this year, which means that our Lenten Journey will start early as well! It all starts on Ash Wednesday, February 18th. 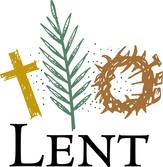 Check back often for Lenten history, facts, reflections and recipes! 1) In large pot, saute the onions, garlic, and ginger in a little olive oil for about 5 minutes. 2) Add water, lentils, chick peas, white kidney beans, diced tomatoes, carrots, celery, garam masala, cardamom, cayenne pepper and cumin. Bring to a boil for a few minutes then simmer for 1 to 1 1/2 hours or longer, until the lentils are soft. 3) Puree half the soup in a food processor or blender. Return the pureed soup to the pot, stir and enjoy. Yield of six servings. pinch of salt. Cook, stirring occasionally, until they begin to soften, about 10 minutes. fresh ground black pepper to taste.